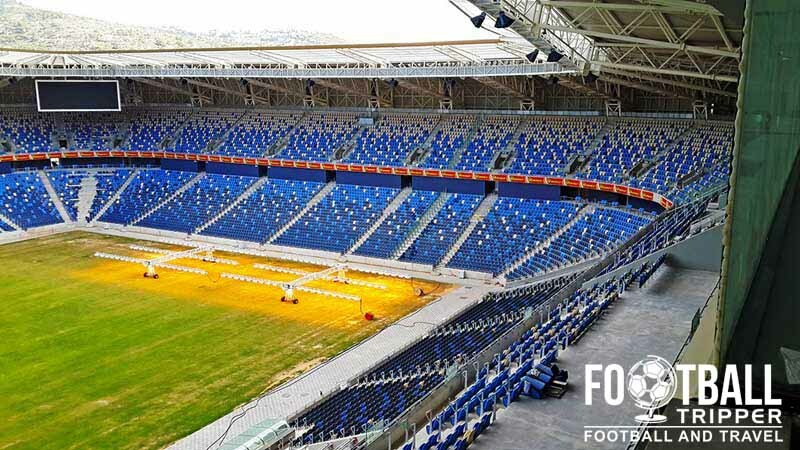 Haifa International Stadium or Sammy Ofer Stadium is a purpose-built football stadium which has been home to the Israeli national team and both Maccabi and Hapoel Haifa since opening in 2014. Construction on the new International standard stadium took place over a five year period beginning in September 2009 almost a year after planning permission was granted. The ground’s notable golden exterior and curvy form was designed by the British based KSS Group. 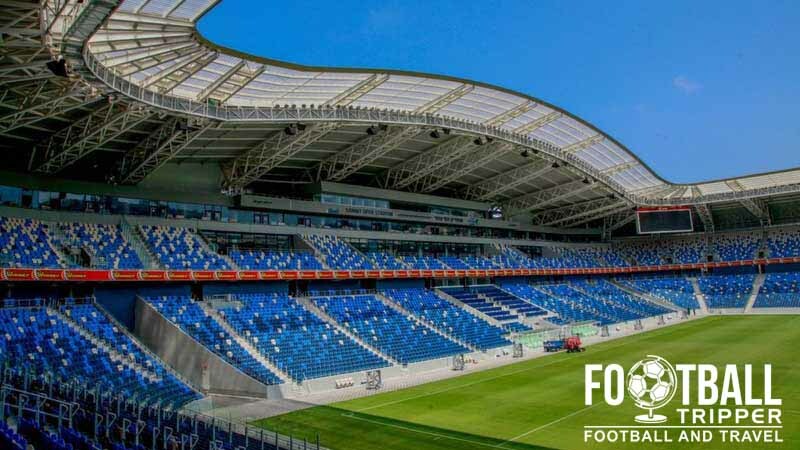 Largely funded by the local municipality of Haifa, Entrepreneur Sammy Ofer donated $20 million dollars or just under 20% of the total construction cost in exchange for the naming rights. The inaugural fixture was played on August 27th 2014 between Hapoel Haifa and Hapoel Acre in the Toto Cup, however it wouldn’t be until a month late that Maccabi Haifa would play their first league match against Bnei Sakhin FC. To date the record attendance was set during an Euro 2016 international qualification match against Bosnia and Herzegovina. Roared on by a passionate crowd, the Israeli underdogs, christened Sammy Ofer in style with an impressive 3-nil victory against their more esteemed opponents. During the 2015/2016 season, Sammy Ofer is set to host the group matches of Maccabi Tel Aviv in the Champions League. Maccabi were drawn in a group containing such prestigious sides as Porto, Dynamo Kyiv and Chelsea. Sammy Ofer is one continuous bowl which can be divided into four parts: North, East, South and West. When Wales played Israel in a Euro 2016 qualifier back in March 2015, the relatively small country was given an initial allocation of 2,000 tickets although a total of 2,892 seats could theoretically be assigned to the visitors. Travelling supporters are housed within the south-west corner of the stadium across two-tiers which are accessible via entrance K.
We will update the map in due course! We don’t currently have any information regarding a club shop at Samy Ofer Stadium but rest assured that you can at least purchase merchandise on matchdays. 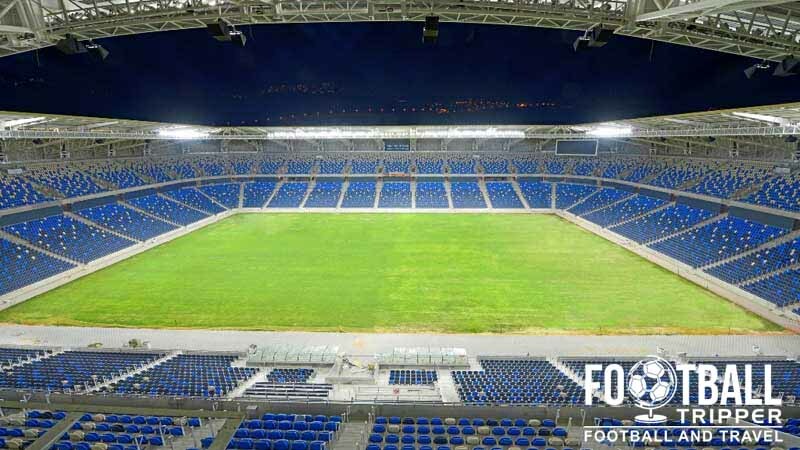 Guided tours of Haifa Stadium can be booked by visiting this page on the official website. Tours typically last 90 minutes, aren’t available on matchdays and cost 25 NIS for adults, and 20 NIS for everyone else. This equates to around €5.00. Tickets to see club football matches can be purchased from the stadium’s ticket office at the northern entrance of the stadium between 9.00 am – 5.00 pm Sunday to Thursday and from 9.00 am to 2.00 pm on Friday. You can purchase tickets for both Maccabi and Hapoel Haifa. International match tickets should be purchased through your country’s football federation/association in advance of the match. 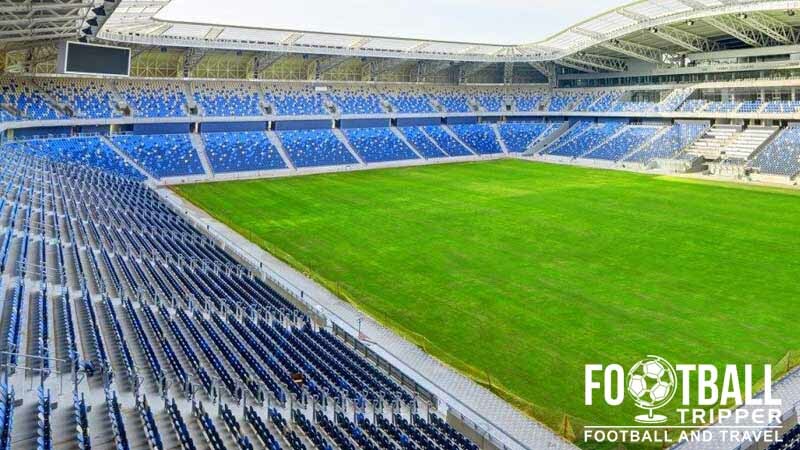 Samy Ofer Stadium is located in the southern outskirts of Haifa within the Matam Business Park. Due to its location walking isn’t very practical, and instead public transport is very much recommended. Sammy Ofer Stadium’s golden exterior lends itself well to illuminations, and is certainly a sight to behold at night time. There are a total of five car parks at the stadium itself with 1,600 spaces in addition to a dozen or so more privately operated ones within the local neighbourhood. This is a rapid bus line and you can reach the stadium from Carmel Beach Central station on Line 1. This is what the majority of fans use to travel to the stadium. The closest railway station is Carmel Beach. From here you can then catch the Metronit bus service or simply walk to the stadium. Outside Sammy Ofer stands a 15 metre tall, 40 ton “World Peace Statue” by Chinese sculptor Yao Yuan. You can catch the following bus services to Carmel Beach Central Station: 3, 11, 29, 43, 46, 101, 112, 115, 123, 132, 133, 146. Haifa Airport is only really served by domestic routes to Tel Aviv and limited international flights to Cyprus, Greece and Jordan. Ben Gurion Airport is regarded as the main International Airport of Israel and is 20km southeast of Tel Aviv. 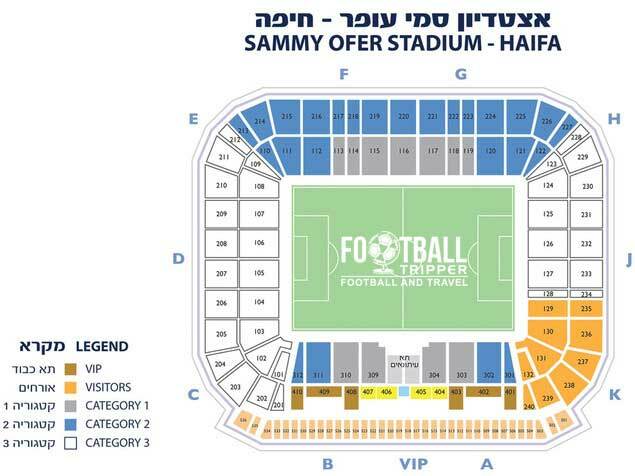 The Garden Hotel appears to be the closest option to Sammy Ofer, with the area immediately around the ground not exactly blessed with accommodation options. You will generally find more back towards the area around Haifa Center HaShmona station.